Yes, we have a date for the start of pre-orders, which will be Monday April 13th. Pre-orders will be open until Monday May 4th. And all the kits will then be sent out on Monday May 18th. 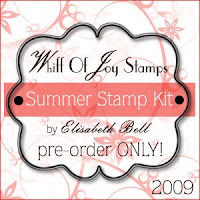 The kit contains 6 fabulous, brand new character stamps and 5 accessory stamp designed by Elisabeth Bell. I had a lot of request regarding sentiments on the kit, that's why you will also receive 4 text stamps designed by myself :) You'll receive all those stamps for the fantastic price of 28 Euros (plus shipping). Our flatrate shipping rates also apply for the stamp kit. For more information about how our stamp kit pre-order works, please have a look at the WoJ webshop. Ja, es gibt schon ein Datum für den Start der Vorbestellung. Und zwar geht es am Montag 13. April los. Vorbestellen könnt ihr das Kit dann bis Montag 4. Mai. Versendet werden alle Kits dann am 18. Mai. Das Kit enthält 6 tolle neue Charakterstempel und 5 Zubehörstempel designed von Elisabeth Bell. Ausserdem hatte ich einige Anfragen ob es auch Texte auf den kits geben könnte. Deswegen bekommt ihr auch noch 4 Textstempel, die von mir designed wurden(auf Englisch), dazu. All diese Stempel erhaltet ihr zu dem super Preis von 28 Euro (plus Versand). Unsere pauschalen Versandkosten gelten auch für das Kit. In den nächsten Tagen gibt es hier bei mir auch einen blog candy um das neue Kit zu feieren, schaut also wieder rein. Für alle weiteren Informationen zu dem kit, schaut einfach im WoJ Webshop vorbei. That sneak peek looks gorgeous!! Can't wait to get mine ordered!! Thanks for keeping us up-to date! I'm thinking of having an affair with my bank manager! lol. Will definitely keep an eye on these. Can't stop playing with my spring ones yet! Super...dan lege ich mich auf die lauer damit ich eins abbekomme....fand das letzte ja auch so toll...mag das neue auch haben wollen !!! Oh my, I'm in love with that sneak peek. Such an adorable face, I love her already!! I'll be ordering for sure. Ohhhhhhhhh freu,freu,freu. Das ist ja sooo klasse.Kann es kaum erwarten. Wauw, I love the sneak already...lol..:)) Can't wait till the pre-order starts. Too cute!! I can't wait, I'm so ready to order. Maybe by the time it's ready I will have the funds to be ready also. Thanks for the sneak peek. Das schaut schon wieder so toll aus!!! Ich werd das Sommerkit ganz sicher auch ordern, der Preis ist absolut sensationell! Oh super , ich freu mich und dann auch noch Texte dazu... freu, freu. Oh wie schön,ein neues Stempel Kit.Na da werde ich mich auch auf die Lauer legen,um die schönen Stempel nicht zu verpassen. I'll be ordering, thanks for the sneak peek! Is the theme going to be strawberries? Die Vorschau sieht wieder vielversprechend aus. Ich bin schon ganz gespannt auf das gesamte Kit!! Das sind tolle News Katharina, ich bestelle mir ganz sicher wieder ein Kit. Die klitzekleine Vorschau hat mich schon überzeugt. Whatever it is, my order will be going in!! Yea - I've been waiting for this - my first Whiff of Joy pre-order! Monday can't get here fast enough! :) Thanks for the update. Wow that stamp looks gorgeous. Thanx for the info, i,ll definietly be back for more sneek peeks, tanx for sharing. Oh, that loos so gorgeous! I'm looking forward to April 13th, when I can place my pre-order with you! I am totally in love with these lovely stamps! The spring stamp kit was wonderful - "Willow with basket" is my favourite at the moment! Hugs, Hege - wishing you Happy Easter! This stamp-set sounds great and the sneak-peak makes me even more convinced. Thank You for adding the sentiments, so generous of you. What can I say only.. I'll be there next monday! I loved the spring-kit and I'm sure the summer-kit will be as adorable as that kit! I am saving my pennies! Waiting patiently for this new set. I love Elizabeth Bell's creations, so lovely and cute. I am always in awe of her creative mind and talent. Watching the calendar. Thanks Katherine. Oh my goodness! How gorgeous!! I can't wait to see the rest of them! Ohhhhhhhh i am so excited about these!!!!!!!!!!! I am ordering 2 sets one for me & one for blog candy !!!!!!!! I am thinking it may be a picnic theme??? ?